"I never thought such simple vertical antennas could make such a big score", Mas, JE3MAS. This comment by Mas was felt by most of the operators... (yee had little faith! de K2KW). I have not heard about other M/M scores, but congratulations to those teams who gave us some stiff competition. I can only assume that others will post higher M/M scores, my hat is off to their accomplishments. **The 6Y4A team would appreciate any comments on our operation, operating styles, signal strength, ease or difficulty working us, etc. Wow, what a fun time! Many people on team had not met each other before gathering in Jamaica, but everyone bonded in the time before the contest, and we all had a great time! Most of us arrived a week before the contest, and we had enough time to take time off to see the local sites, and the highlight was walking up Dunns River Falls (some of the group climbed twice!). The location of the site was on the north shore of Jamaica about halfway between MoBay and Ocho Rios. The antennas were set up on 600' of ocean-front. This was a field-day type of operation, with all equipment and antennas were brought down by the operators. * The outstanding 40m QSO totals turned out by Dave, W9QA, and Mas, JE3MAS. They had a total of 3739 QSOs (not including dupes), which I believe is a new QSO record on that band. And all this was done with 15' high 40 m antennas! When doing the forecasts for our operation, it was my belief that with the right combination of location, antennas, and operators, that the 40m QSO total should just about equal the 20m score. Well, these guys proved that theory correct by out-QSOing the 20m position by 15 contacts. Great job guys! 4000 QSOs on 40m is not out of the question for next year. * The first ever JA-6Y QSO on 160m was made by N6BT before the contest, with a few contacts made during the contest. 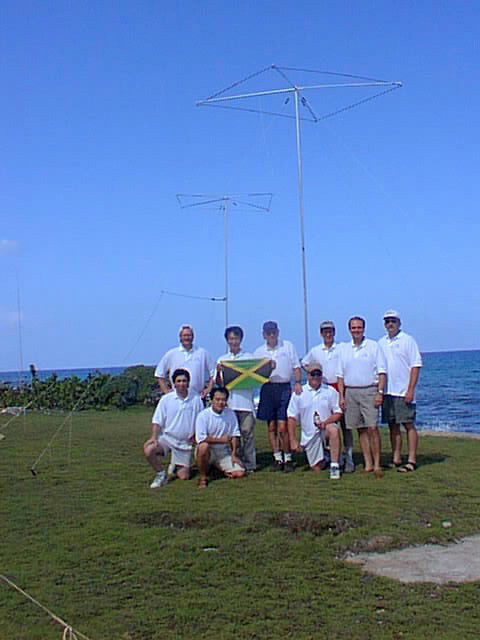 Amongst the operators, over a dozen JA stations were worked during the trip, with the best conditions coming the morning after the contest, with signals peaking an honest 579 from the stronger stations. All antennas supplied by Force 12, and the antenna systems for this operation were designed by N6BT and K2KW. Coax costs were supplemented by Nemal Electronics. All antennas, and 24' of mast, fit into 4 hard-case golf club carriers, and weighed just under 280 pounds, including the cases. It was hard to believe that all the antennas for a multi-multi operation could fit in those 4 small cases, and at that weight! Great job Tom! And many, many, thanks from the 6Y4A team. Essentially this was an all-vertical antenna system. 20m (1): 4 element "2x2 array" fixed on EU. Array consists of a phased pair of 2 element quarter wave verticals that are parasitically coupled. Two raised radials per element. A.K.A. "Flame thrower" Primarily since one of the bamboo poles supporting the radials burst into flames due to high voltage, but also since it was very strong into EU. WX0B StackMatch box used to combine both 20m antennas. 20m (2): 2 ele quarter wave verticals, parasitically coupled, fixed on USA/JA, 2 elevated radials per element. 15m (1): 2 ele quarter wave verticals, parasitically coupled, fixed at 10 degrees for USA/JA and EU, 2 elevated radials per element, WX0B StackMatch box used to combine the 15m antennas. 15m (2): 2 element horizontal yagi at 30'. 15m (3): 8 element inverted-V yagi fixed on EU, sloping from 40' to 20' high (this was put up a few hours before the start of the contest since we thought we needed extra gain to counter the solar flare. The antenna had a 4 dB edge over the other antennas at the peak of the opening). 10m (1): 2 ele vertical dipole array parasitically coupled, fixed at 10 degrees for USA/JA and EU, WX0B StackMatch Box. 10m (2): 2 element horizontal yagi at 33' mounted on bamboo poles lashed together. Much of the details and research that went into the antenna design will be published in the upcoming February issue of CQ Contest magazine. For those of you following the thread on these antennas (there was some discussion on cq-contest@contesting. Com a while back), we had a problem in the 1997 6Y4A ARRL DX CW operation with the melting (breaking) of the guy ropes due to high voltage. The melting occurred due to the salt water build up on the nylon ropes, which then became conductive. This year we went to great extents to reduce the potential of this occurring, but we still lost one guy rope, where the rope had simultaneously melted on both sides of a 4" long insulator separating the vertical from the guy rope. The bamboo pole on the 20m radial burst into flames since we ran out of insulators for the radials and just wrapped the end of the radial around the bamboo. We later went back and used tie-wraps as insulators when we ran out of ceramic insulators. But we also lost (melted) a few tie-wraps, and the radials fell down! If anyone tells you that a vertical is a simple antenna that just requires a few radials of random length just thrown around, does not know what they are talking about! We had to tune the verticals by adjusting the radial length, and adjusting the height of the radial above ground. And you DO need radials even if the antenna is just a few feet from the salt water. They had lots of antennas on 10/15/20, but feedline lengths were unknown, and the system was not set up for stacks... because of this, they did not try to stack or combine the antennas. "Glenn feels that our use of the WX0B StackMatch boxes was one key to our success. The lack of line noise was another major factor, in his opinion. Glenn greatly admired the constant attention to detail by our own Kenny Silverman." While the StackMatch is one factor in our success, there were lots of other factors. And I get the feeling that even these guys still underestimate the power of the vertical. BTW, when we use the StackMatch for antenna combining, I dont care about feed line length - I just hook 'em up. In Jamaica we did a test to see how the power was being split between each antenna in all the various combinations. We had power meters in line with each antenna. While the power distribution was not equal, and varied with each particular combination, there is no doubt that even small power in another direction is a powerful tool. The StackMatch makes this technique really easy.